"Daigasso! Band Brothers (大合奏!バンドブラザーズ, Daigassō! Bando Burazāzu?, lit. "Grand Ensemble! Band Brothers") is a music game published and developed by Nintendo for the Nintendo DS handheld game console. It was released in Japan on December 2, 2004 as a launch game for the Nintendo DS, introducing the character of Barbara Bat. The game features multiple songs, which include classical music, television themes, and video game music. The game is controlled using both the DS' buttons as well as its touch screen in certain portions. It uses a variety of different instruments, which are combined selectively in order to compose a song. Besides the primary mode, players may play together, each one playing a different instrument in the song. Players may also compose their own songs. It was to be released in the United States as Jam with the Band, but was never released nor formally cancelled. It has a sequel titled Jam with the Band, which was released in Japan in 2008 and in Europe in 2010." 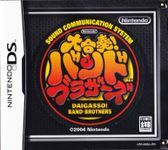 Source: Wikipedia, "Daigasso!_Band_Brothers," available under the CC-BY-SA License.